Hi everyone, & welcome to this week’s edition of PaleoNews. With the beginning of 2016 a bunch of new species have been described, many of which gigantic in size. There’s Machimosaurus rex, one of the largest crocodyliforms yet discovered. Notocolossus, a new giant species of titanosaur from Argentina has also been described, tying in with the opening of the American Museum of Natural History’s titanosaur exhibit. The AMNH titanosaur mount measures 122 feet long, and this as-yet-unnamed species could be the largest dinosaur known to science. Crocodilians have a way to terrify yet fascinate us humans. Their scaly skin, piercing eyes, and wrinkly jaws remind us of their ancient beginnings. The Salt Water Crocodile is the largest known modern species, measuring around 18 feet on average. Even this giant would be dwarfed, however, by Machimosaurus rex, a 30 foot long teleosaurid crocodyliform from the Cretaceous of Tunisia (Fanti et. al., 2016). Machimosaurus rex is the largest Machimosaurus species and one of the largest known crocodyliforms. It is is also the youngest known teleosaurid, hailing from the Early Cretaceous (Fanti et. al., 2016). This shows that the teleosaurids did not go extinct at the end of the Jurassic, as was presupposed (Fanti et. al., 2016). M. rex also seems to have been a generalist predator, hunting the lagoons and waterways it swam within (Fanti et. al., 2016). Machimosaurus rex is small fry itself compared to other animals which have been described this year. Notocolossus is a newly-described genus of giant titanosaur which roamed Argentina during the Cretaceous. The holotype of Notocolossus gonzalezparejasi is especially notable for its well-preserved hind foot, which allows researchers to better understand the evolution of sauropod feet. The animal was described by Riga et. al. in the journal Scientific Reports. The American Museum of Natural History’s titanosaur mount was recently revealed. The discovery of this titanic animal (larger than even the gigantic Notocolossus) was announced in May 2014, and a description is pending. These guys have got company! Big company. Remember my post on the “Welsh Theropod”. The Animal has been described and was given the truly awesome name Dracoraptor, meaning dragon thief. The 2 meter long animal roamed Wales during the Early Jurassic period, leaving behind a partial specimen (Martill et. al., 2016). At Archosaur Musings, Dave Hone has guest artist Rebecca Gelernter us a peek into the process behind restoring a dinosaur. She talks specifically about the Protoceratops illustration she did for a recent paper. The post is filled with fantastic artwork and I definitely recommend checking it out here. At Twilight Beasts, its all about moas! You can go find the detailed post on this group of extinct birds here! At SVPOW, Matt Wedel covers the new giant titanosaur Notocolossus. He covers some pretty interesting stuff about the morphology of the giant’s bones, including the fact that the known vertebrae of Notocolossus are remarkably similar to those known of Puertasaurus. You can find this post here. At Inside the Royal Tyrrell Museum, they talk about Museum Hack, a company that develops non-traditional museum tours. This post should be especially interesting to those actively working at museums and wondering how to further improve the education and the experience of guests. 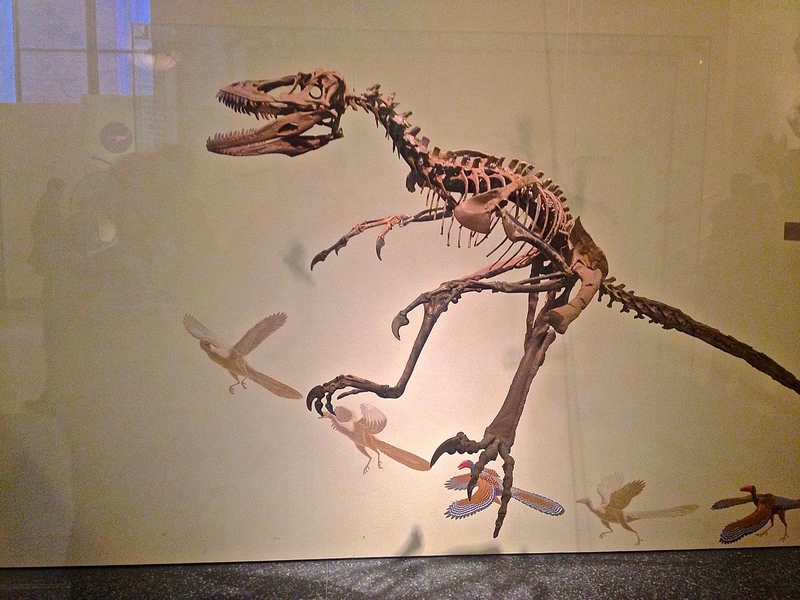 At Mark Witton’s Blog, Mark discusses the integument of dinosaurs, showing just how interesting the known skin, scales, and feathers of dinosaurs were. You can find that post here. At Letters from Gondwana, ferwen discusses Robert Hooke and his influence on the sciences of geology and paleontology. It is a fascinating post and can be found here. This week we have CM 31374, the skull of a Coelophysis bauri. Coelophysis was a genus of lightweight theropod dinosaur which lived during the Late Triassic and possibly the Early Jurassic. 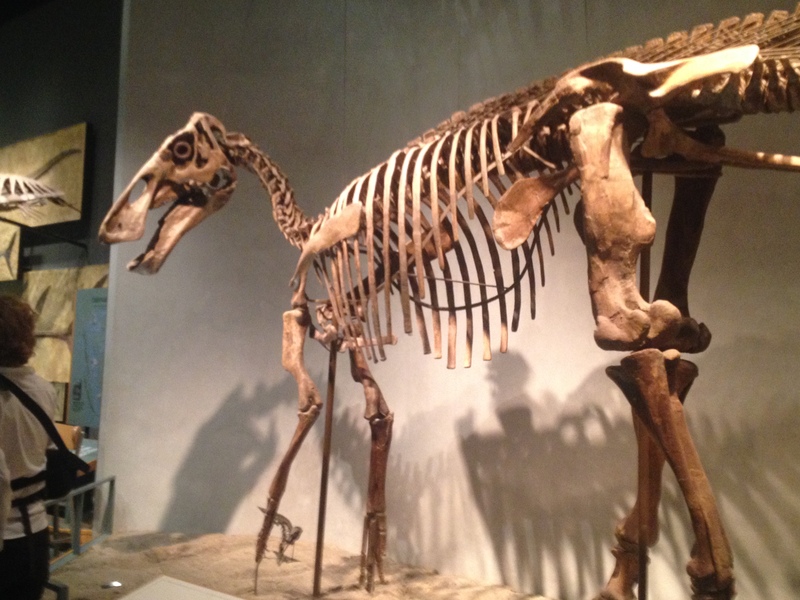 Closely related to the northeastern Podokesaurus and likely was a hunter of small game. CM 31374 itself hails from Ghost Ranch, New Mexico. Fanti, F.; Miyashita, T.; Cantelli, L.; Mnasri, F.; Dridi, J.; Contessi, M.; Cau, A. “The largest thalattosuchian (Crocodylomorpha) supports teleosaurid survival across the Jurassic-Cretaceous boundary”. Cretaceous Research.doi:10.1016/j.cretres.2015.11.011. Riga, B. J. G.; .2016. “A gigantic new dinosaur from Argentina and the evolution of the sauropod hind foot.” Scientific Reports. doi: 10.1038/srep19165. Martill, D.M. ; Vidovic S.U. ; Howells C.; Nudds J.R. 2016. “The Oldest Jurassic Dinosaur: A Basal Neotheropod from the Hettangian of Great Britain.” PLoS ONE 11(1): e0145713. doi:10.1371/journal.pone.0145713. Hello everyone! The new year is approaching, and it is time to look back on the fossil finds of 2015 as well as discuss some new discoveries! Dimetrodon (not D. borealis here) attacks an Eryops at the Denver Museum of Nature and Science. Photo by the author, 2015. This new discovery is especially exciting for those who work on the prehistory of eastern North America. A new species of Dimetrodon, D. borealis, has been described on the basis of a partial snout from Prince Edward Island (Brink et. al., 2015). The snout was the second fossil specimen collected from Canada (Brink et. al., 2015), and has long been the subject of taxonomic confusion. It was previously classified as a dinosaur before being classified as a sphenacodont (Brink et. al., 2015). The placement of this specimen Dimetrodon not only provides further information on the evolution of the Permian fauna of the east coast of North America but also widens the range of Dimetrodon to include the northern US. A new species of palaeomerycid has been described from the Miocene of Spain. The new species, named Xenokeryx amidalae, bore some oddly-shaped crests unique from other members of the group. The description paper also brought with it a new phylogenetic analysis which found that palaeomerycids are not in fact related to dromomerycids (Sánchez et. al., 2015) a theory previously supported by many. The name of the new palaeomerycid alludes to the Star Wars character Padme Amidala, as the headgear of Xenokeryx amidalae bear a resemblance to one of the character’s hairstyles in the (awful) movie “The Phantom Menace” (Sánchez et. al., 2015). A new species of Phosphorosaurus has been described from fossils found in northern Japan which likely had binocular vision, allowing for depth perception (Konishi et. al., 2015). Incredibly, this mosasaur might have hunted at night, using its large eyes to better detect prey in the darkness. 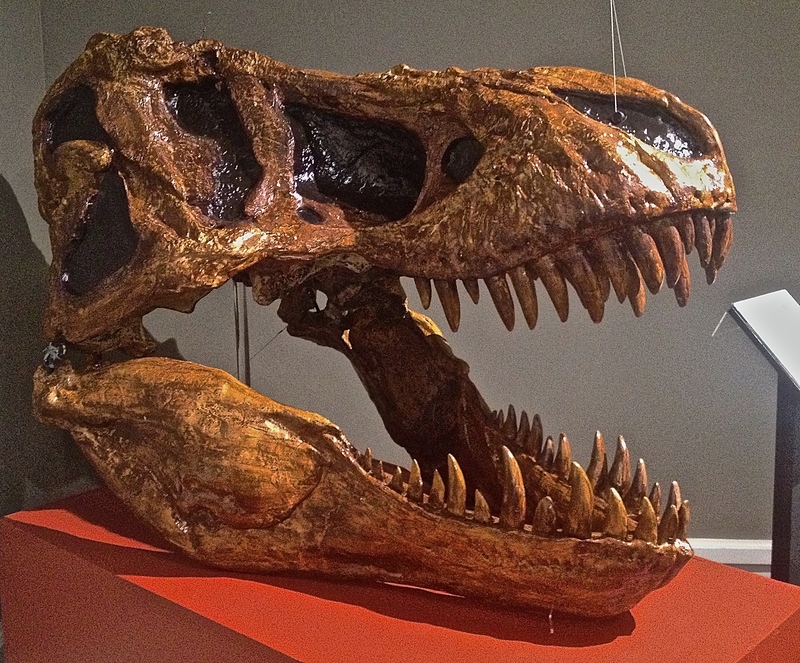 2015 proved to be quite a fantastic year in paleontology. A maniraptoran with membraneous wings, a basal theropod with two-clawed hands and adaptations for a herbivorous lifestyle, an extremely ancient seal, a new species of gigantic elephant-relative, and a relative of the ancestor of crocodilians which stalked the deltas of Triassic North America on two legs were some of the most surprising discoveries. 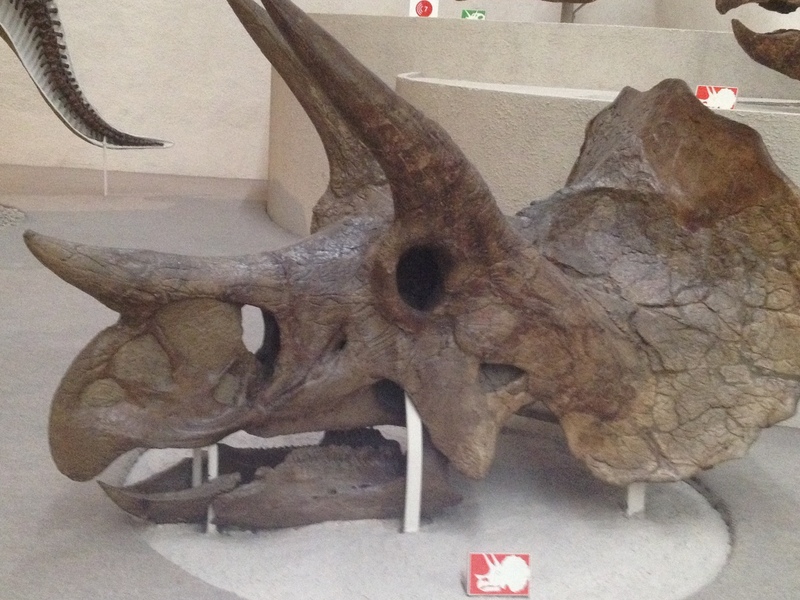 As is annual tradition on this blog (last year there were only dinosaurs), here is the 2015 “Prehistory Parade”, showcasing some of the most amazing discoveries of this past year. Happy 2016 everyone! Brink, K. S.; Maddin, H. C.; Evans, D. C.; Reisz, R.; Sues. H.2015. “Re-evaluation of the historic Canadian fossil Bathygnathus borealis from the Early Permian of Prince Edward Island.” Canadian Journal of Earth Sciences 52 (12): 1109-1120. Sánchez, I. M.; Cantalapiedra, J. L.; Ríos, M.; Quiralte, V.; Morales, J. 2015. “Systematics and Evolution of the Miocene Three-Horned Palaeomerycid Ruminants (Mammalia, Cetartiodactyla).” PLoS ONE 10(12): e0143034. Konishi, T.; Caldwell, M. W.; Nishimura, T.; Sakurai, K.; Tanoue, K. 2015. “A new halisaurine mosasaur (Squamata: Halisaurinae) from Japan: the first record in the western Pacific realm and the first documented insights into binocular vision in mosasaurs.” Journal of Systematic Palaeontology: 1–31.